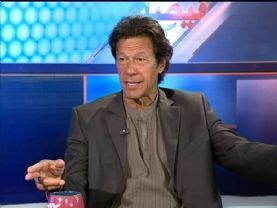 Pakistan Tehrik-e-Insaf chief Imran Khan has said that the Judiciary has disappointed, media reported on Monday. Imran Khan said while talking on TV show ‘Faisal Aap Ka’ this evening that the courts have failed to serve that purpose for which their freedom was gained. He added that the President should appear before the Swiss courts; the people are frustrating from the judiciary. While talking over polls, the PTI chief said that he supports immediate elections in the country and if polls will not be free and fare the decisions would be taken on the roads. “Balochistan issue cannot be resolved through army and killings of Shiites must end in Balochistan and other parts of the country,” Imran Khan added.